Acer's TravelMate 5720-602G16Mi targets the corporate user, and is a 15.4-inch machine offering power and strength. Open the lid and the most striking aspect is the keyboard. With a ﬁve-degree curve that ensures your hands point inwards when typing, it's ergonomic, although can be difﬁcult to adjust to for those with smaller hands. The screen is a standard TFT panel, which is better for use on the road. It lacks some of the vibrancy seen on the best screens, but it's bright and usable. As with most corporate laptops, graphics are provided by an integrated GPU. This means you won't be able to carry out demanding 3D tasks, but it's ﬁne for running ofﬁce applications or DVDs. The integrated card beneﬁts battery life, with the machine lasting for over three hours in our benchmarks. It may not be the smallest of machines, but a semi-portable 2.8kg weight means you'll be able to take it on the road occasionally. Those who do travel with this laptop won't have to worry about build quality, as it's one of the sturdier laptops we've tested. All of the plastics are free from ﬂex, and the use of magnesium-alloy behind the screen means there's more than enough protection for the display when in your bag. 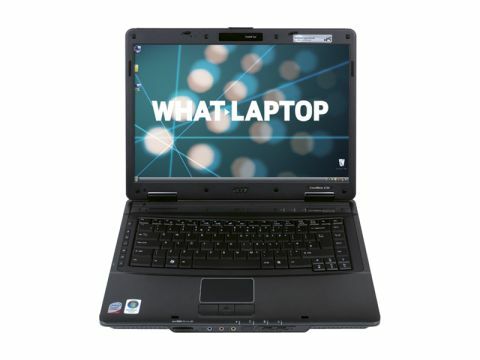 Everyday performance was impressive, helped by a high-end Intel 2.2GHz Core 2 Duo T7500 processor and 2048MB of memory. Our only gripe was the heat generated, and the palm rests got particularly warm during use. The 160GB hard drive is enough for most uses, but is no better than average . The Acer TravelMate 5720-602G16Mi is a good all-round laptop, and its strength and power make it worth considering for those requiring a corporate laptop.